Bone grafting is an oral surgery procedure needed to allow for patients to have the necessary height and width of bone for implant placement. The jaw bone can recede due to several reasons, including missing teeth, periodontal disease surrounding teeth, infections and enlargement of the maxillary sinus. When this occurs, there is not enough bone as a foundation to support a dental implant, and bone grafting is recommended to ensure bony support. It is usually best to have bone grafting with a dental extraction. This allows for the tooth socket to have the greatest potential to fill in the tooth socket with your own bone. The bone graft, when placed, acts as a site stabilizer until your body is able to fill in the site. Autogenous Bone Graft: This is bone harvested or obtained from a patient’s own body. This gives the most predictable result as live bone cells are present in aiding to produce new bone. Allograft Bone Graft: Bone obtained from a cadaver, which has been through a rigorous process to ensure its sterility. Xenograft Bone Graft: Bone obtained from a cow, which has also been through a rigorous process to ensure its sterility. The process of bone grafting can take 3-6 months, depending on the amount of bone needed and the site of grafting. Bone is either taken from your own body or a bone bank and placed in the area of interest. During these months, the body is signaled to venture to the area of interest and replace the bone graft with the body’s own bone. Dr. Benjamin Yagoubian has had extensive training in bone grafting. He looks forward to restoring your jaw bone with a bone graft in the Torrance, Palos Verdes and the Redondo Beach area. In the upper jaw, there are two air filled areas known as the maxillary sinus. The maxillary sinus changes with age and can increase in size (pneumatization). When the sinus hangs lower, it encroaches upon the available bone for dental implants. 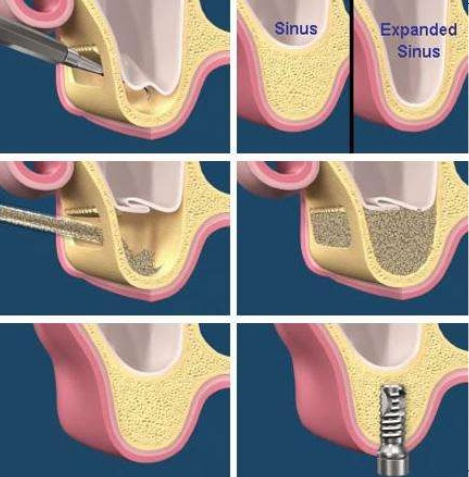 This process can be reversed with maxillary sinus lifts. This surgical procedure involves lifting the gum, creating a bony window to gain access to the sinus and then gently lifting the sinus tissue. Once the sinus tissue is raised, the bone graft is placed within the cavity created, and in around 4-6 months the body will place its own bone in the area. Dr. Benjamin Yagoubian has had extensive training in sinus lifting. He looks forward to restoring your jaw bone with a sinus lift in the Torrance, Palos Verdes and Redondo Beach area. Contact us today to schedule your initial consultation with Dr. Yagoubian.